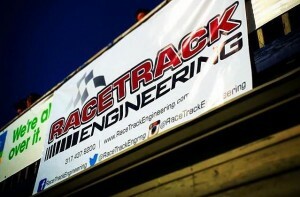 At the age of thirteen months, RaceTrack Engineering Founder Dave Dusick was diagnosed with an incurable cancer. It was Rhabdomyosarcoma, an incurable cancer. At that time, one in a million kids got it, and none survived. Dusick was given a 50% chance of living six months. 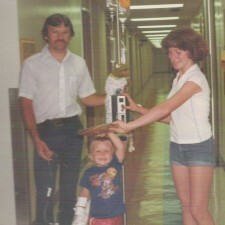 Within days, Dusick was admitted into his new home, Riley Hospital for Children in Indianapolis, Indiana. Over the next twenty-four months, Dusick endured numerous surgeries, chemotherapy and radiation. Thanks to the efforts of the staff at Riley, an amazing support network of family and friends, a whole lot of Prayer and one great big miracle, he was declared clear of all signs of cancer in the Summer of 1980. Through turning is adversity into strength, Dusick has become a recognizable figure in many professional and social communities. While not many know his story, it seems that no matter where you go, everyone knows Dave. He and the “IKDD Nation” hope to use his recognition to create a positive endeavor that benefits current and future families suffering from a life-altering childhood illness. For more information, please visit iknowdavedusick.com. 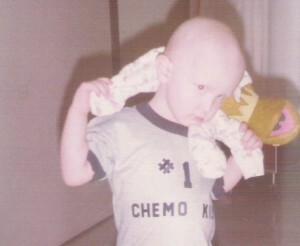 Dusick was a #1 Chemo Kid while being treated at Riley Hospital for Children in Indianapolis. 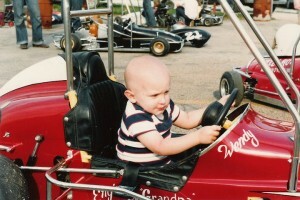 Born to race, Dusick, despite his battle, enjoyed being around motorsports ever since a young age. Seen here, Dusick spent much of his early childhood at Riley, battling and beating the odds to overcome a life-altering illness.